The other day I received a request that I find 40-80 photos of my fine young son for a Senior Night montage. Just a simple little task, right? Because someone else has a great idea to honor my son, I have a little over a month to cull through thousands of photos, some digital, some print. And, despite my grand plans when my kids were babies, I hopped off the scrapbooking train years ago. Now it's simply a dot on the distant horizon, and our family pictures are disorganized and scattered in various places. So, this will be something of a project for me. Add this to the list of getting my son's college details in order, planning his graduation party, and let's not forget that my daughter has her middle school graduation coming with all of its important details too. Please don't hear this as me complaining. I want to engage this precious time of life. I want to feel its joys and meet its challenges. It really is only a few months that will fly quickly by. When they're gone, I know I'll wish I could have them back. At the same time, I want to keep my eyes on the concept of creating my life. I feel a delicate balance here. This seesaw will swing back and forth with focus being evenly balanced and/or leaning heavily in one direction or the other. Part of my process is to discern which focus needs my attention this moment. 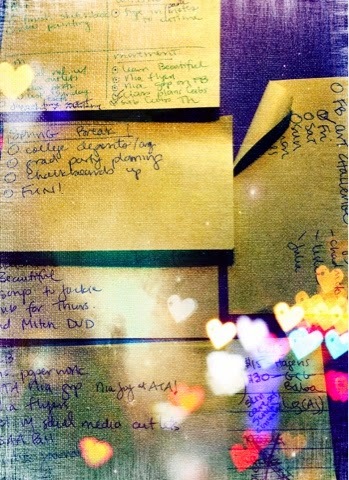 Hence the to do list (pictured). I am not a structured, organized person. I used to be, but I burnt out that muscle long ago. More recently I've learned to survive and thrive by intuitively determining what I need to do each day. But at this phase of my life, I'm fielding many requests, and I don't want to drop the ball, especially anything as precious as my children's graduations or future plans. So, creating my life sometimes takes a back seat. And I'm developing a perspective in my mind and heart that accept this reality joyfully so I can fully engage in the tasks at hand (and the joy of crossing items off that to do list!). Creating my life is just as much about enjoying this phase with all of its demands. It's about motherhood and actively engaging the transition I'm in, receiving the shift as it comes and proactively determining what kind of mother I want to become as my kids mature and fly the nest.